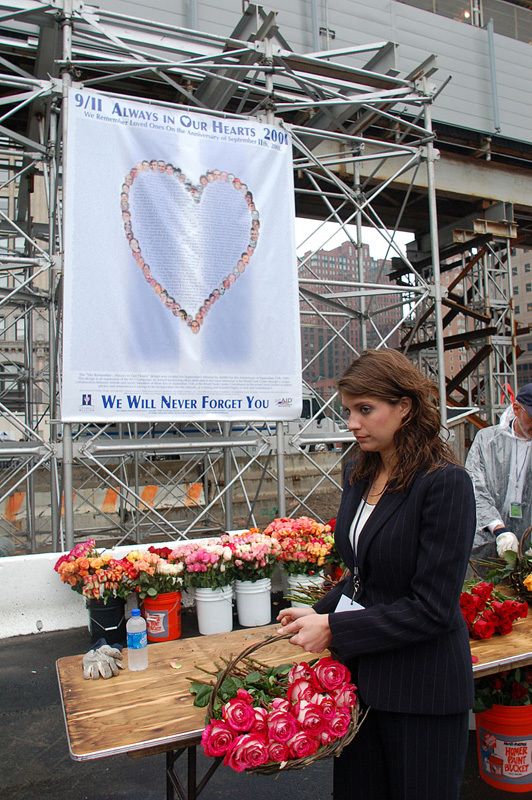 Healing at Ground Zero on the 6th Anniversary. Click to download 8x10 print. The 6th Anniversary of September 11th at Ground Zero. GROUND ZERO, NY -- SEPTEMBER 11, 2007: Once again, ArtAID continues a tradition of healing and remembrance at Ground Zero during the 6th Anniversary ceremony. Beautiful large scale colorful banners brightnened this somber day, and a commemorative memorial poster was given to family members who visited the bedrock on what may be the last opportunity to do so. Compassioned volunteers braved the elements for several hours to hand the prints to family members and participating rescue and recovery workers who read the names this year. They were greeted with profound gratitude and appreciation from friends and family members who have come to celebrate the joy of this growing community who have been drawn closer together through the tragedy of September 11th. See Pictures here. ArtAID provides healing through beauty and celebration of the lives of friends and family. 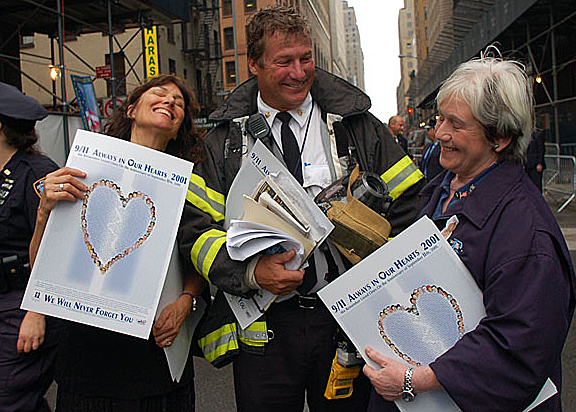 ArtAID volunteers Constance Merrick and Sue Lucarelli distribute the 2007 "Always in Our Hearts" posters at Ground Zero. See more images here.